Handout was created for the Digital Humanities course: “Panama Silver, Asian Gold: Migration, Money, and the Making of the Modern Caribbean” (Fall 2013 syllabus: http://dloc.com/AA00013935/). 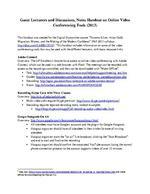 This handout includes information on some of the video conferencing tools that may be used with the different lecturers, with basic resource links. Guest Lecturers and Discussions, Notes Handout on Online Video Conferenci n g Tools (2013) This handout was created for the Digital Humanities course : Panama Silver, Asian Gold : Migration, Money, and the Making of the Modern Caribbean ( F all 2013 syllabus: http://dloc.com/AA00013935/ ) T his handout includes information on some of the video conferencing tools that may be used with the different lecturers with basic resource links. Adobe Connect Overview: The UF Smathers Libraries have a ccess to online video conferenc ing with Adobe Connect, which can be used in a web browser with Flash T he meetings can be recorded with access to the recordings controlled, and then can be downloaded with Make Offline Test : http://ufsmathers.adobeconnect.com/common/help/en/support/meeting_test.htm G uide s : http://www.connectusers.com/learning_center/getting_started/quickstart.php Recording: http://agsci.psu.edu/it/how to/record an adobe connect session 1 Room: http://ufsmathers.adobeconnect.co m/NAMEFORROOM Recording Skype Calls with Two+ Classes Overview: http://citt.ufl.edu/tools/skype/ Multi v ideo c all s require Skype premium: http://www.skype.com/en/pre mium/ Recording requires separate recording tools ; random examples : o http://shop.skype.com/apps/Call recording audio video/index.html Google Hangouts On Air Overview: http://www.google.com/+/learnmore/hangouts/onair.html All attendees must have Google+ accounts and the plugin for Google Hangouts Hangout organizer should have all attendees in their circles for ease of inviting attendees. Hangout organizer starts th e on air live broadcast clicking the Start Broadcast and end to start and finalize the recording. Hangout organizer should confirm the associated YouT ube account (using the normal ph one connection process) so the account supports videos of over 15 minutes. 1 A lso, see : http://www.con nectusers.com/tutorials/2010/11/c8_recording_a_meeting/index.php and make offline for downloading the files as FLV.